Kelp, sometimes known as Sea Kelp, refers to a group of brown algae or seaweed. It is said that there are more than 30 related species, although it will be true that some have yet to be discovered. Kelp grows at the bottom of relatively shallow parts of oceans in ‘kelp forests’ and thrives best in nutrient rich sea at temperatures around 10°C. Although kelp may be found in the seas of many parts of the temperate world, they appear to grow particularly well in the Pacific Ocean. 1 tablet 2 - 3 times daily before food. Do not take before bedtime. Below are reviews of A Vogel Kelp - 240 x 250mg Tablets by bodykind customers. If you have tried this product we'd love to hear what you think so please leave a review. Kelp, sometimes known as Sea Kelp, refers to a group of brown algae or seaweed. 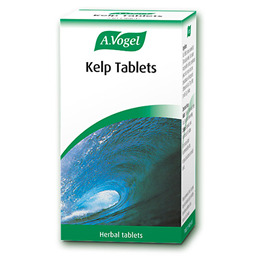 Kelp tablets are rich in iodine which helps maintain thyroid function and normal production of thyroid hormones.